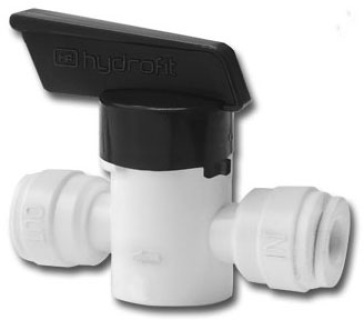 whole house water treatment and other systems. 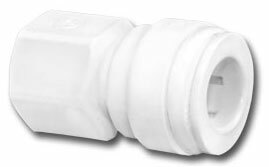 HYDROFIT Quick Connect Fittings, valves and tubing have been tested by NSF International under NSF/ANSI Standard 61 and comply with FDA requirements for all materials in contact with food and drinking water. 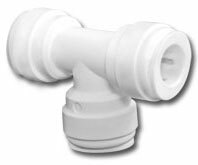 HYDROFIT fittings and buting have been independently tested to NSF/ANSI 58 Standards for Burst pressure, Static pressure and Cyclic pressure testing and undergo rigorous quality assurance testing for quality performance time and time again. 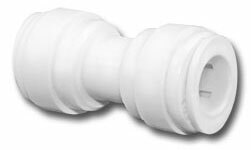 HYDROFIT Quick Connect Fittings are ideal for a broad range of applications: reverse osmosis systems, water coolers, coffee machines, RVs, misting systems, marine, point-of-use water filtration, car wash systems and many others. 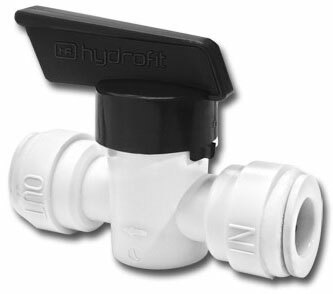 HYDROFIT fittings do not require the use of any special tools for installation and create a tight seal on many tubing types. 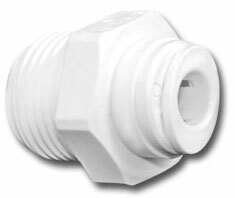 Please call our office if you cannot locate the fitting you need. 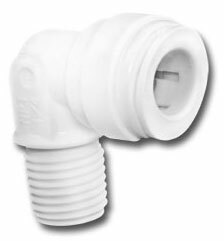 ALL FITTINGS EXCEPT FOR INLINE VALVES AVAILABLE IN PACKAGES OF 10 FITTINGS ONLY. 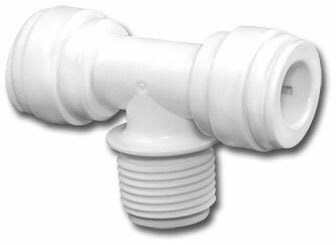 Inline valve with push-style 1/4" union connectors. Inline valve with push-style 3/8" union connectors.